Matty Heron (white) is Whittlesey's top scorer. Whittlesey Athletic need to find their scoring boots quickly or kis goodbye to their chances of winning the Peterborough Premier Division title. 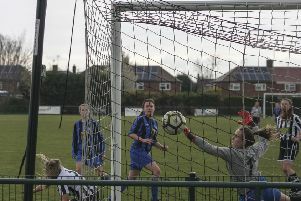 Whittlesey lost more ground on unbeaten leaders Moulton Harrox after slipping to a 1-0 home defeat to a dogged Pinchbeck side last weekend (March 12). And that was a second successive scoring blank for Andy Lodge’s men who were held to a 0-0 draw at Netherton United the previous weekend (March 5). Whittlesey are now three points behind Moulton having played two games more. They have a potential season-defining contest at Peterborough Sports Reseves tomorrow 9March 19). Sports moved above Whittlesey into second after their own 4-1 win at Deeping Rangers Reserves. Lodge said: “We haven’t created enough chances in the last two matches which is unlike us. Us and Netherton always cancel each other out, but I expected better against Pinchbeck. “They are a decent, top-six side, but after they took the lead they defended far too comfortably for my liking. “Liam Harrold has been on the bench for the last two matches because of a niggle which hasn’t helped us, but we still have Matty Heron and he’s one of the top scorers in the league so we should be doing better. “We need to sort it out quickly as we can’t afford to lose any more ground to a Moulton side who have been impessively consistent. A Tony Edwards penalty 15 minutes into the second-half secured victory for Pinchbeck, while Moulton were winning 3-1 at Thorney to make it 19 victories in 20 matches. Sports host Moulton on Tuesday (March 22) in another big game.